I can never get enough of artichokes. Whether there are on a pizza, in a pasta dish, or just by themselves. And a creamy vegan artichoke dip? YES, please!! Get me a whole bowl! Just by myself! Haha! No, I will of course share. Maybe. No, just kidding. But it really is so good that you don’t wanna share it! 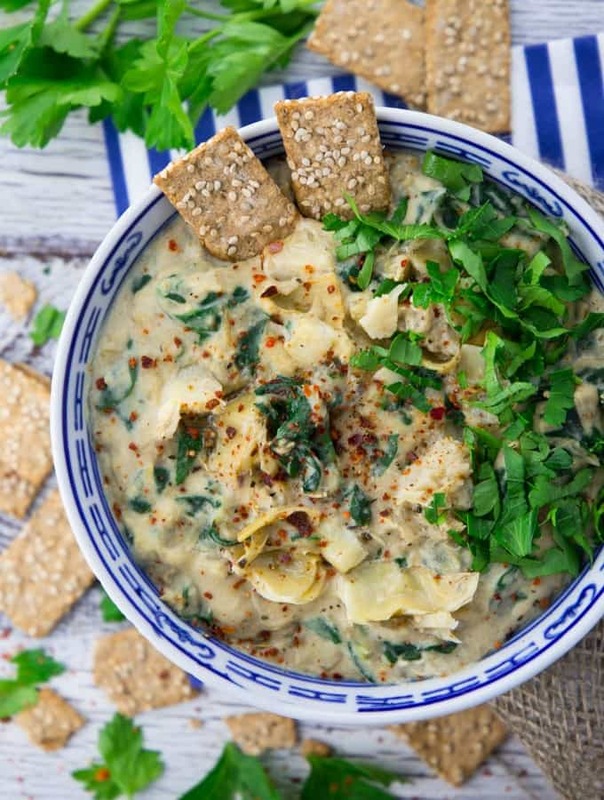 And it’s so much healthier than regular spinach artichoke dip. Instead of sour cream, mayonnaise, and Parmesan, this vegan spinach dip calls for white beans and cashews. They make it incredibly creamy and healthy at the same time! This vegan dip is not only super delicious but also packed with protein! For the cheesy flavor, I added nutritional yeast. 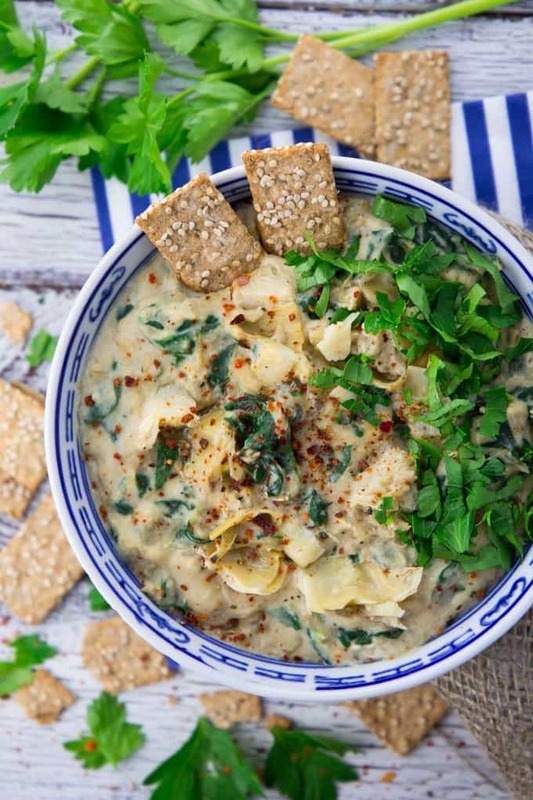 You only need very basic ingredients for this vegan spinach dip. Nothing fancy or hard to find. Drain the canned white beans and put them in a blender together with the cashews. If you want to make it a bit easier for your blender, you can soak them in water for 4-6 hours before using them. Once you’re done blending the cashews and the white beans, heat some oil in a large pan and sauté the onion and cook the spinach for a couple of minutes. Combine all ingredients in a large bowl, season with salt and pepper and you’re good to go. Yummy! As always, you can find the full ingredient list as well as the detailed recipe instructions in a separate, printable recipe box beneath the text section. I LOVE bringing this vegan spinach dip to parties and family get-togethers. Or sometimes we just enjoy it on the couch while watching Netflix. Haha! It’s the little things that make life great, isn’t it? 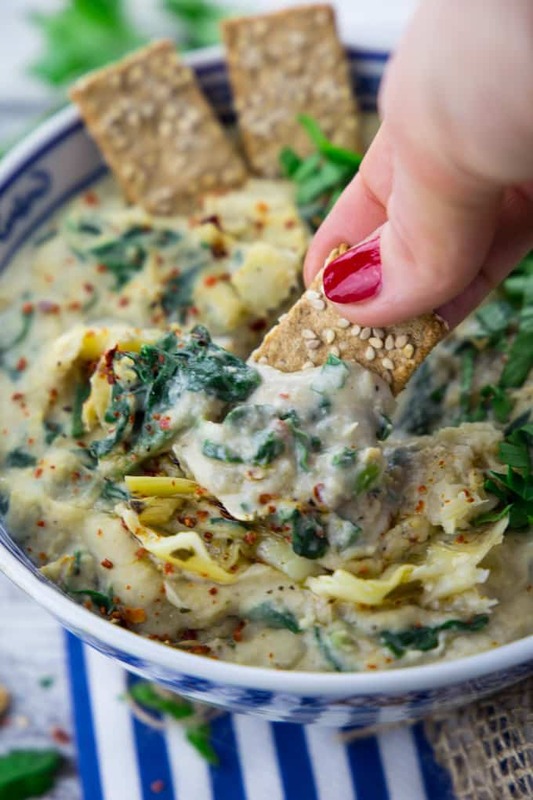 You can enjoy this vegan spinach artichoke dip warm as well as cold. But I usually prefer to eat it when it’s warm. It’s just SO comforting! If you’re looking for more delicious dips, you might also like my pumpkin hummus . 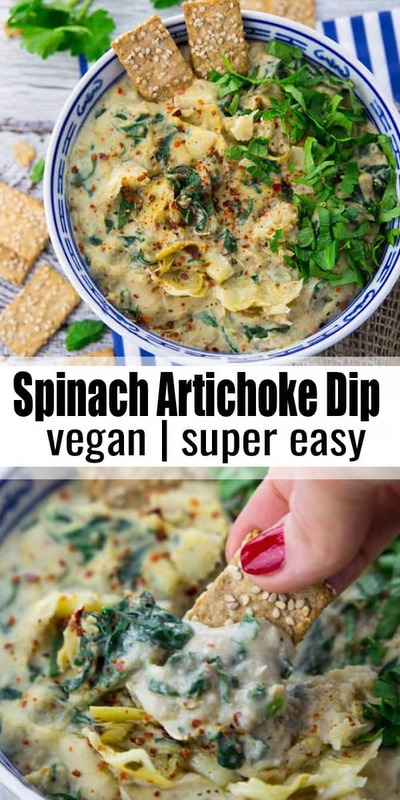 Vegan Spinach Dip with Artichokes - Super Creamy! 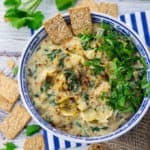 This vegan spinach artichoke dip is my favorite dip to bring to parties and family get-togethers! It's so incredibly creamy, rich, and healthy at the same time. Instead of mayonnaise and sour cream, this vegan recipe calls for white beans and cashews. They make it so creamy! Rinse an drain the canned white beans and put them in a blender together with the cashews, the lemon juice, and the nutritional yeast. If you want to make it a bit easier for your blender, you can soak them in water for 4-6 hours before using them. Put aside. Heat some oil in a large pan and sauté the onion for about 3 minutes until they become translucent. After 2 minutes, add the garlic. Then add the spinach and cook for 3 more minutes. Season with salt and pepper. Add the artichokes and stir in the white bean cashew mixture. Again season with salt, pepper, and if using red pepper flakes. Sprinkle with chopped fresh parsley and serve with whole wheat sesame crackers. We are trying to find recipes that are allergy friendly for our son who is allergic to dairy, eggs, tree nuts, wheat, pineapple, coconut, to name a few. Is it necessary for the quality of the recipe to add in the cashews? Are there any ideas for a replacement? I would like to know this too as I am allergic to soy, peanut & tree nuts, dairy, and eggs. This was amazingly good. I left out the Spinach and added a can of diced green chilies (drained). I also doubled the nutritional yeast. Served with Rosemary Olive oil Triscuits and crudites. I seriously could have eaten the WHOLE BOWL! I can’t wait to try slathered on pizza or flatbread. 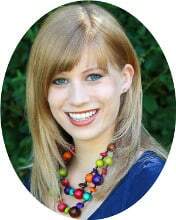 I’m dairy free for the time being because my infant has a dairy allergy, and I’ve been challenged with finding flavorful dairy-free recipes for my entire family. I’m going to try this recipe this weekend! I used the blended cashews for green bean casserole over Thanksgiving and I was very impressed with the results. Thanks for posting this!! So glad you’re trying the recipe! :-) Let me know how you liked it. Yes, blended cashews are AMAZING! They’re so creamy! I’d like to make this, but my son is allergic to cashews. Could I substitute veganaise for the cashews? Any idea how much it would take to substitute? I haven’t tried substituting veganaise for the cashews. It will change the texture, but I think this could work out. :-) Maybe try adding 1/2 cup of vegenaise. You could also add more, it depends on how “rich” you want the dip. I was wondering if there was a specific type of cashews needed for the recipe, Like roasted and salted or did they need to be raw? This is so delicious! Our entire family loved it. We typically don’t add salt and it was perfect without the added salt. We also served it with raw veggies, so so good! Thank you for the recipe! Brought this to a vegan potluck tonight (I’m not vegan so was happy to find the recipe). Everyone loved it! Thanks! I was looking for a vegan dip for football season – this is great. The seasoning is easily adjustable and it is versatile to use with other dishes. Thanks for sharing! Made this for New Year’s Day and it was great! Thanks for the recipe! This is one of my all-time favorite recipes! Ever. Recently I substituted kale for the spinach because that’s all I had and liked it just as much, if not better. I love this with super seedy crackers or some gluten free kale/corn based crackers, but best of all might be mixed in with some chickpea pasta. The pasta really makes it a meal.